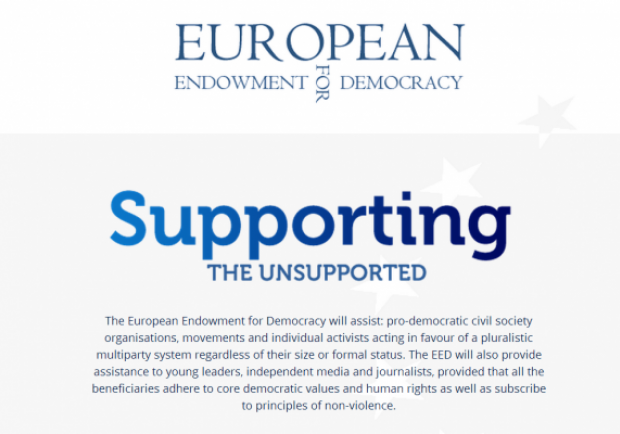 The European Endowment for Democracy Will Assist: pro-democratic civil society Organisations, movements and individual activists acting in Favour of a pluralistic multiparty system regardless of size or Their formal status. The EED Will Also provide assistance to young leaders, independent media and Journalists, That all the Beneficiaries provided adher to core democratic values ​​and human rights as well as subscribe to Principles of non-violence. EED works in a flexible way and therefore receives and assesses request for support in year ongoing manner. THUS there is no deadline, and we are happy to Receive your ideas at any time. The support provided by EED CAN Vary in size and duration. However Normally average grants range between € 10,000 and € 150,000. EED assists pro-democratic civil society Organisations, movements and individual activists acting in Favour of a pluralistic multiparty system regardless of size or Their formal status. EED acknowledges the existing range of pro-democracy Mainly Donors and seeks to act as a gap-filler. We therefore Give priority to activities That Would be difficult to back through other existing channels. In doing so, we follow a demand-driven and Needs-based approach. Following the EED covers countries / territories: Algeria, Armenia, Azerbaijan, Belarus, Egypt, Georgia, Jordan, Libya, Lebanon, Moldova, Morocco, the Occupied Palestinian Territories, Syria, Tunisia and Ukraine. EED support is THUS Aimed at Actors from These countries / territories. EED Will treat your information as private and confidential. We will not provide your information to any other organization, UNLESS you specifically authorise us to do so. Please refer to the EED mission statement for Further information about our role and Priorities.